This salad has lots of bright flavors and a mix of textures, so I love it with a citrusy, prickly sparkling wine. The citrus-and-avocado salad is a staple at this time of year, and I wanted to create a more substantial version that didn't involve any meat or seafood. My solution: lentils, tossed with crunchy radishes and fennel. This salad has lots of bright flavors and a mix of textures, so I love it with a citrusy, prickly sparkling wine. 1. Using a sharp knife, remove the peel and bitter white pith from the grapefruit. Cut in between the membranes to release the grapefruit sections and slice the fruit into 1-inch chunks. Transfer to a medium bowl. 2. Squeeze the juice from the membranes into a measuring cup. Add enough rice vinegar to the juice to measure ¼ cup total. In a large bowl, combine the shallot with the grapefruit juice and vinegar and let stand for 5 minutes. 3. Add the lentils, radishes, fennel and olive oil to the shallot and toss, then season with salt and pepper and toss again. 4. Halve and pit the avocado and cut into 1-inch dice. Add the avocado to the grapefruit, season with salt and a little lime juice and toss. 5. 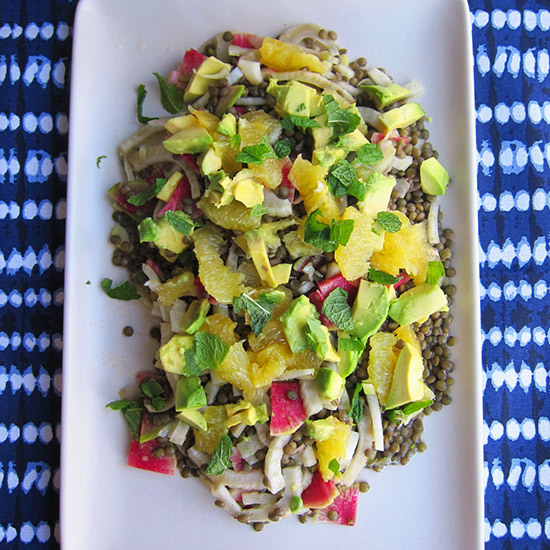 Transfer the lentil salad to a platter and top with the avocado and grapefruit. Garnish the salad with torn mint leaves and serve at room temperature. One serving 336 cal, 17 gm fat, 2.3 gm sat fat, 37 gm carb, 16 gm fiber, 13 gm protein. Wine A French sparkling wine, such as Albert Mann Crémant d'Alsace Brut.